The reason I got the Modkat Litter Box: it looks good. Plain and simple. 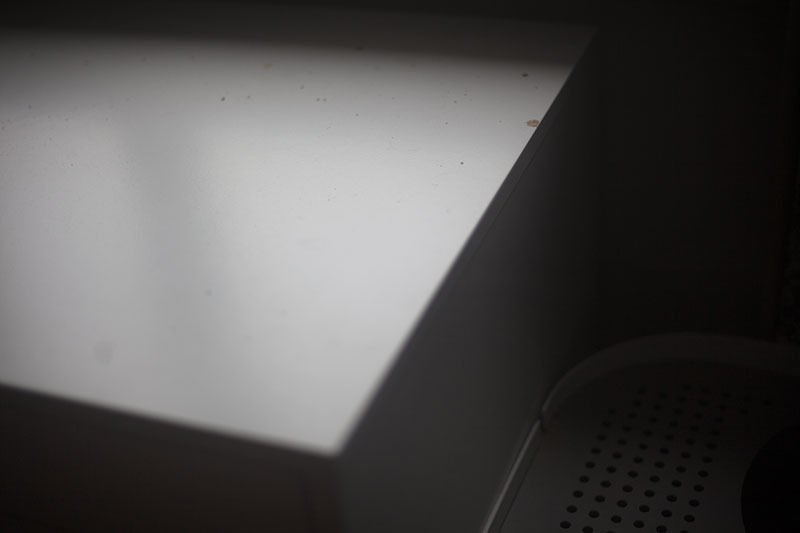 Of course its other primary feature – the fact that it’s top opening, played a huge part in encouraging me to buy this thing, but let’s be honest; there are few very good looking litter boxes on the market, and finding one that happens to fit in with your furniture is rare as ever. 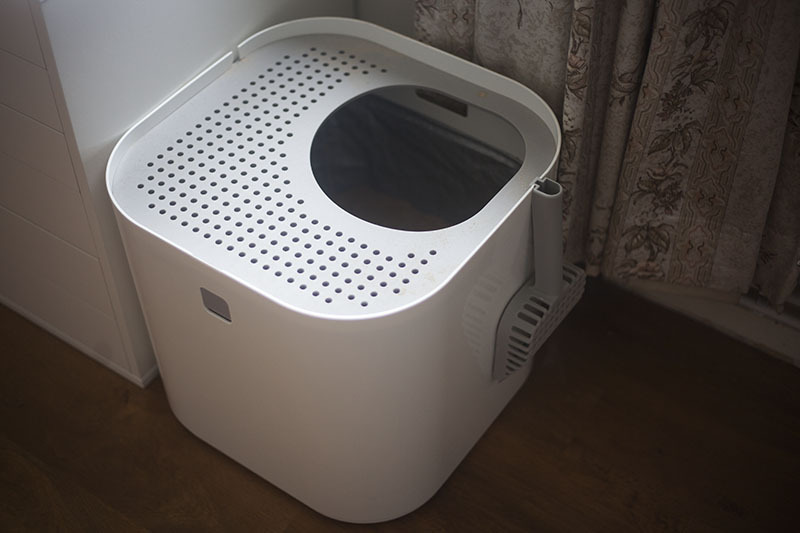 The fact that the Modkat Top Entry Cat Litter Box did so was nothing short of a miracle, so while I can’t say I was very happy with the price tag on the item, I can say that now that I’ve broken the bank for it, I’m happy as a clam that I did. 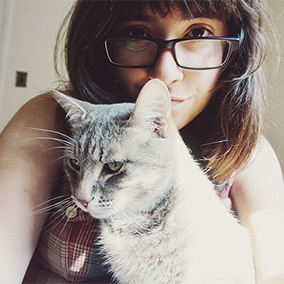 Thomas and I live in a studio flat – not a one bedroom, a studio, and we both work as bloggers from home. So while we’re not quite short on living space (it’s a pretty big studio that at least has a separate kitchen and a spacious bathroom), we don’t exactly have extra space in spades. When we first moved in, we started out having Avery’s litter box in the washroom. 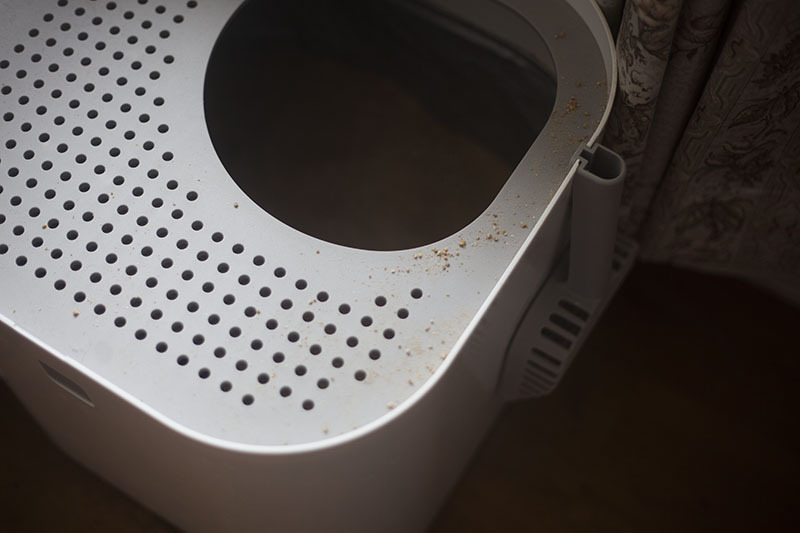 It made sense to us even though we weren’t going to be flushing our kitty litter down the toilet (we can, but we’d rather not just in case way down the line we end up messing up the plumbing. If we were in a house, we certainly would, but being in an apartment building, we can’t help feeling it’s wise not to). A few things changed our minds about the litter-box-in-the-bathroom arrangement pretty quickly. First, Avery’s pretty aggressive when it comes to covering his litter. So when he scratches – it’s loud. And our walls, while not the thinnest, are still thin enough to hear through if you’ve got loud enough noises. We can hear whenever our neighbours vacuum or run their washing machine, for example. 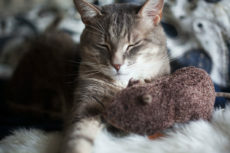 Avery’s use of the litter box in the washroom bothered me only a bit initially, but then came one fateful day where he had to use the litter box at around 4 or 5 AM. He dug and scratched a bit longer than usual, then around 10 minutes later, I heard coughing from the neighbour’s bathroom. Yup. I’m pretty sure our cat using the litter box woke up a neighbour. That litter box was out of there and moved into our bedroom/living room/everything-area by morning. I wasn’t going to be “that neighbour.” No way in hell. Even if it somehow was a coincidence the neighbour woke up (maybe they were just getting up anyway? ), and it wasn’t actually Avery’s aggressive scratching, I didn’t want to risk it. Our washroom is particularly echo-y and also has a vent in it that runs through the building, making it so that you can probably hear a lot of what goes on in it just solely because of the vent. I wasn’t going to chance keeping the litter box in the bathroom anymore under any circumstance. But then came the other problems, of course. 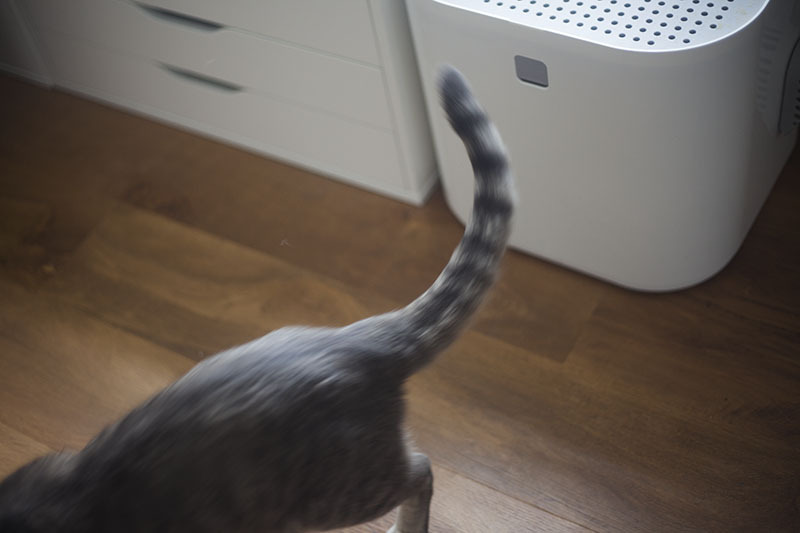 With most litter boxes, litter gets tracked everywhere. Okay enough if the box is in the bathroom, just sweep regularly there and you’re usually dandy. 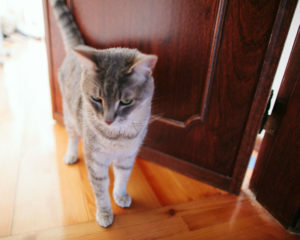 But if it’s in the main room where you live, and is (where we kept it) right in front of the bathroom door, that litter is going to get tracked across half the flat, not just because of your cat jumping around immediately after going, but also because you’re dragging it along with you as you pass through the high-traffic area. 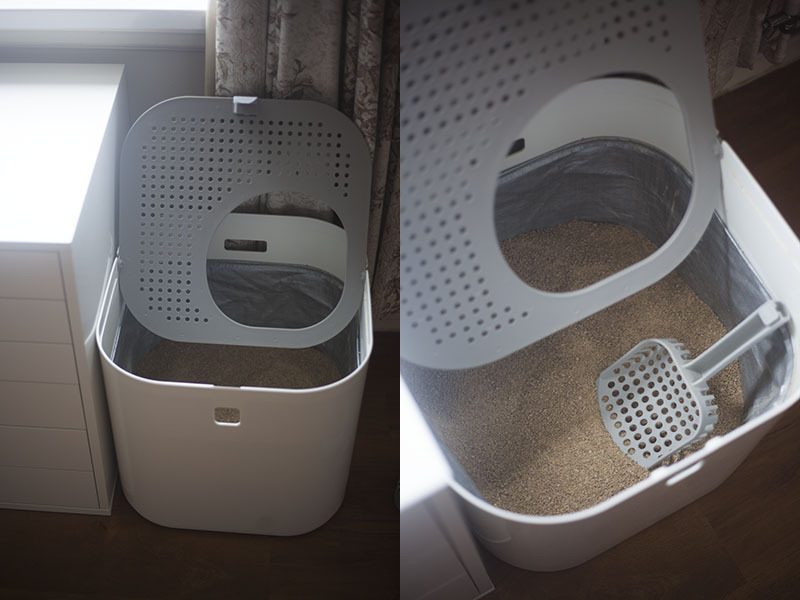 So there was the solution of getting a top-open litter box. Appealing, but I was really worried Avery wouldn’t take to it. 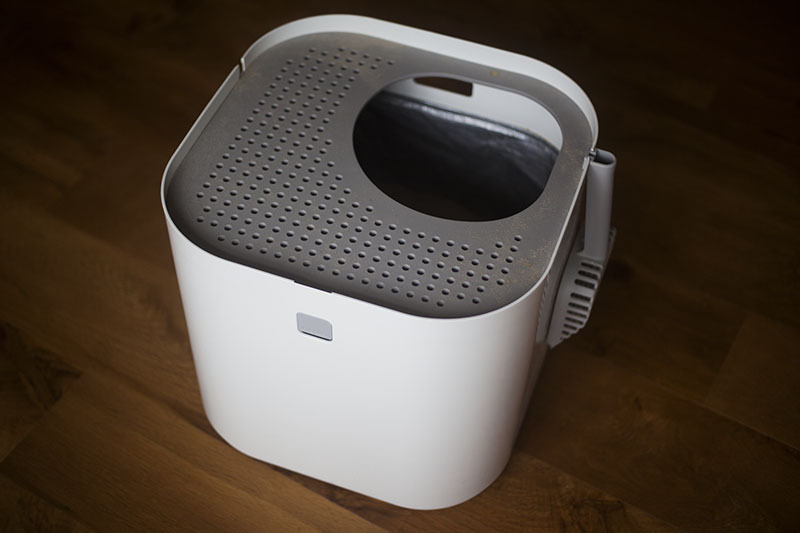 I was also bothered about the way most litter boxes looked, but of course, this Modkat Litter Box solved both problems in one go – if it delivered. Some people seemed to have problems with it breaking on them – not at all a fun problem to have, especially when the box is so expensive in the first place. Replacing the litter box if it broke wouldn’t be easy to do at this price point. Luckily, however, I made note that it was possible to replace just the lid (the part that seemed to break most often) if it came to that, and I consulted Thomas about whether it would be easy to DIY something out of metal instead of plastic if the plastic just wouldn’t hold up – he said it would be no problem. So I took all these as green lights, bit the bullet when it came to cost, and purchased the Modkat Litter Box. First day we put it in the house, I was nervous. Really nervous. We put new litter in the Modkat and moved our old litter box into the washroom and closed the door. 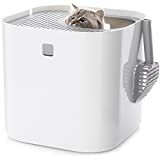 Figured it’d be good to have there just in case the cat needed to use the litter and couldn’t for the life of him figure out how to use the Modkat. I’m not exaggerating when I say Avery seemed scared of the litter box that first day. 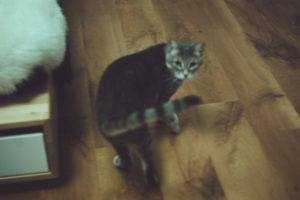 He didn’t go in it, though that may be our fault – we had the door to the washroom open as we were taking a bath so he pranced into the washroom and used his old litter box. Then it was night time. I was worried about going to bed and him needing to use the litter, but not being able to, and me not knowing until it was too late and he’d had an accident. A silly thing to worry about since I am a light sleeper, but he seemed afraid of this thing (kept running off of it when I put him on top of it, or walking away if I put him near it), and I’d never seen him venture to go into it at all. So I thought I’d take matters into my own hands, and read through some of the comments on Amazon to see how other people trained their cats to go into top-entry litter boxes for the first time. One recommendation I read was to take a bit of the old litter and mix it in with the new litter in the new litter box. 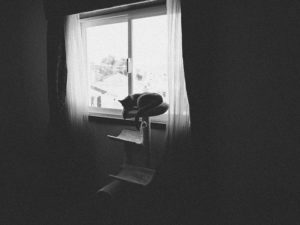 That way the cat would smell his or her own scent, encouraging them to do their business there. I did this. 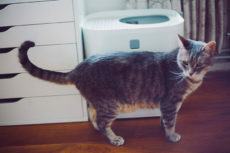 Another recommendation was to get rid of the old cat litter box, as a cat would almost certainly go into an old litter box if they had the choice. I did this by keeping the door to the bathroom closed to my cat from then on. He might’ve known the litter box was there, but he couldn’t get to it and he knew that as well. Yet another recommendation was to put the litter box where the old one had been, but I’d already been doing that. My issue was getting the cat to be comfortable on and in the box. I was really, really worried he couldn’t figure things out for himself. Much more so than I needed to be. Chances are, if I left him long enough, he’d have just used the Modkat Litter Box. After all, he wasn’t stupid, and if he needed to go, he needed to go – something Thomas told me over and over. My worry-wart self never got the message to sink in; I really wanted to make sure he was okay and not afraid of the litter box. He was fine. I really should not have been so worried. He needed to pee so he hopped onto the litter box lid, slowly pulled himself down into the box, did his business, buried it, jumped out like a ninja, and moved on with his life. Now more on the cat box. We’ve had it for around 3 months. Modkat says the liners last roughly that, and we have a back-up one just in case, but I honestly don’t think it’s going to last less than 6 months to a year. The liner is pretty damn sturdy. The litter tracking – yes, it still happens, but nowhere near as much as it used to. Not every piece of litter falls between the holes on the lid, and so you’ll end up with some litter on the lid and some litter still stuck to kitty’s feet, but it’s much better than any regular side-entry litter box I’ve ever seen, and between myself, my mother, and my brother, we’ve used around 3 side-entry litter boxes before. They just can’t compete with tracking reduction like top-entry boxes can. The top is sturdy enough if your cat doesn’t fling himself onto it. Avery’s a pretty cautious cat, doesn’t like it when surfaces feel like they can’t hold him, even if they can. Doesn’t like it either when surfaces he stands on shake a little, so I find he eases himself onto the Modkat Litter Box lid pretty gently. We have it so that there’s a short chest of drawers right next to the litter box, it’s slightly higher than the Modkat, but while he sometimes goes down from there, I find he more often eases himself up from the floor – and the lid has no problems holding up his weight while he does that. 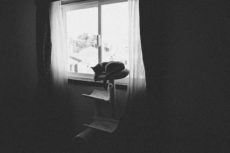 He will sometimes fly out the litter box when he’s done his business without even touching the lid on his way out – I don’t know how cats do this, but we’ve got to get some genetic alterations to be as agile as them in the future. Either way, other times he just slugs back out lazily, and again, has no problems getting out or putting his weight on the lid to help himself out. You take out the scooper, press the button (the logo that says “modko”) at the front, then tilt the lid back to clean out the cat litter. 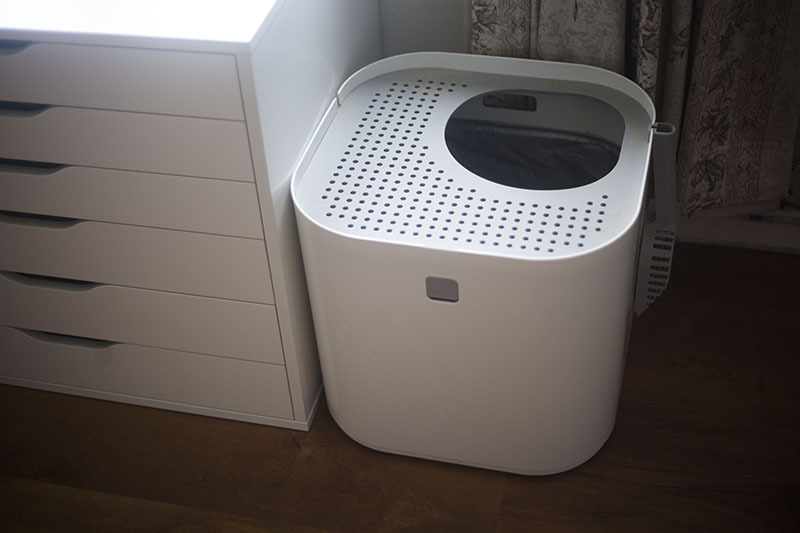 It’s a very simple process and is honestly so much more tidy than regular side-entry cat litter boxes, as you don’t have to reach through, but only down to get your cleaning done. 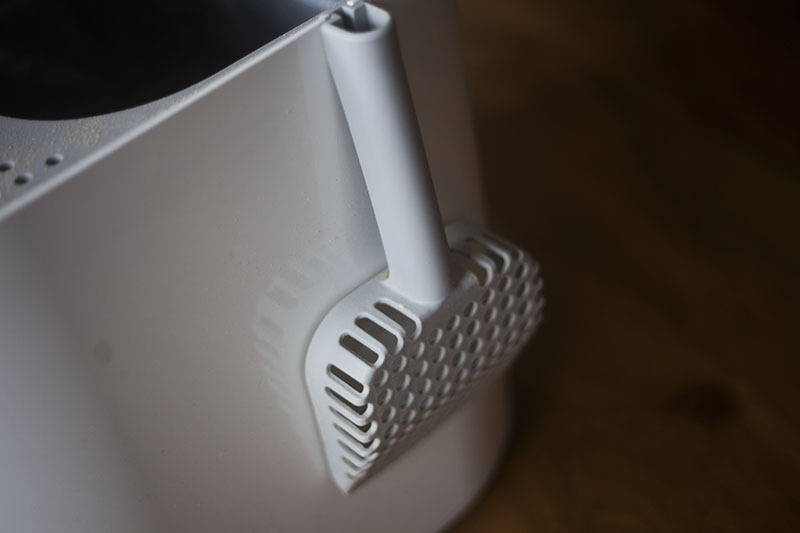 The scooper is fantastic. I’ve used a lot of litter scoopers and this is by far one of the best. 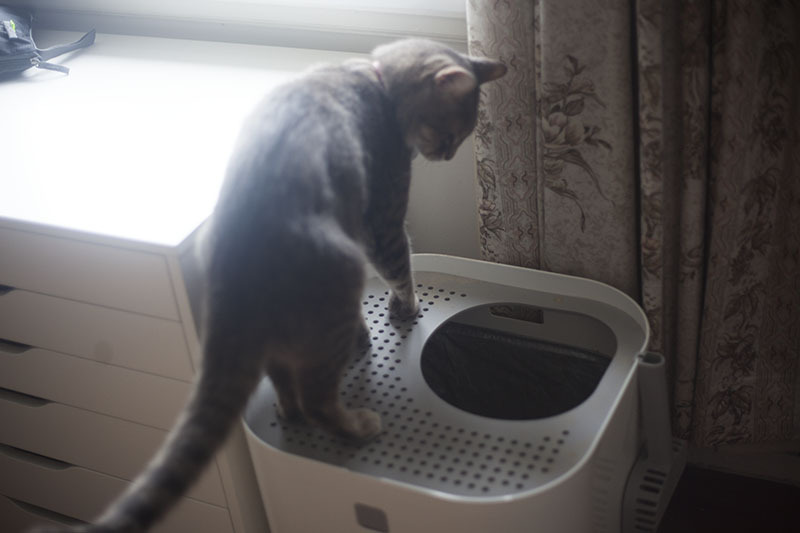 It’s sturdy, the holes aren’t too big or too small, it’s curved perfectly for the corners of the Modkat Litter Box, honestly there’s nothing to complain about at all there. Pouring litter into the box is a breeze. 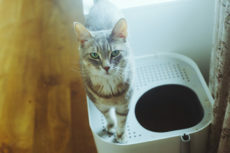 Again, much easier than any side-entry litter box is to fill, not that that’s something I was ever annoyed about, but it’s something to mention. I keep the litter relatively high, probably around 3-4 inches high, as I used to be paranoid that if I didn’t clean frequently enough Avery would not be happy using the litter box and would leave accidents elsewhere (never happened of course; am just a paranoid person). With the Modkat, I don’t really need to worry about over-filling the litter. Most side-entry litter boxes made tracking insane if you’ve overfilled them. 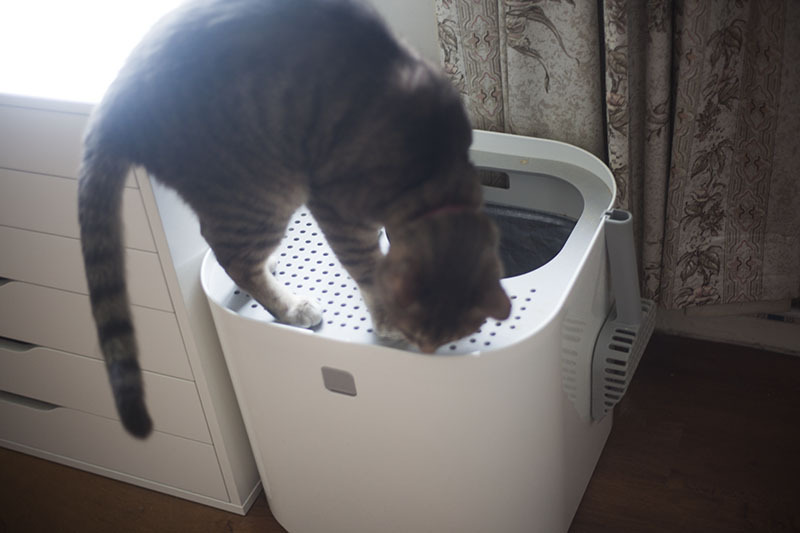 This is not an issue at all if you’ve got the Modkat, or I’d imagine any other top-entry cat litter box. Another thing I’ve been happy with – Avery makes a lot less noise when he digs to cover up his business now. My guess is that part of the reason why is because scratching against the liner is a lot quieter than scratching against the plastic of a litter box. Another part of the reason is probably due to the fact that there’s so much more litter. He ends up grabbing the litter when burying instead of scratching against the bottom of the box. The fact that there’s so much litter in there for him to use also means that he ends up in the litter box for far less time – something I’m pretty happy with. I’m a light sleeper, so it still wakes me up when he gets up in the middle of the night to use the little kitty’s room, but it’s less headache inducing than the old litter box was, he goes at the scratching for a lot less time, and I can fall back asleep quite easily (not enough noise to keep me awake, just to wake me up) once I realize it’s just the cat doing his business. 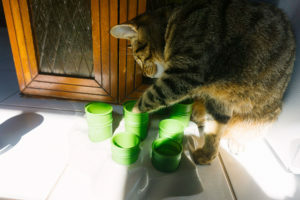 Having the ability to keep the litter quite deep also means that there’s less smell coming from the litter box – or at least to me there seems to be – than with a side-entry litter box. The cat pee is covered up almost completely – you can’t always tell if your cat’s done his or her business yet just by eyeballing it. I can often tell with poo, but again, not always. It just depends on how thorough my cat was. 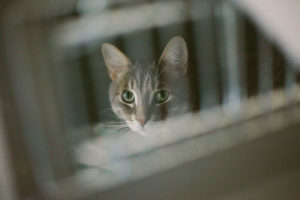 In a side-entry litter box, peering in, I could always tell if there was something to clean. There just wasn’t enough space for anything to be completely buried. Here there most certainly is. What else is there to say besides the fact that the thing is gorgeous? It barely looks like a litter box, looks more like a cute piece of cat furniture, or a storage box of some kind (besides the lid and the cat scooper of course). It’s sleek and pretty, and comes in different colours in case it makes no sense for you to buy the standard. I got white, which I’m glad I had the option to do, because I may not have bought a black one if that was the only colour option available – it just wouldn’t go with anything in my flat. 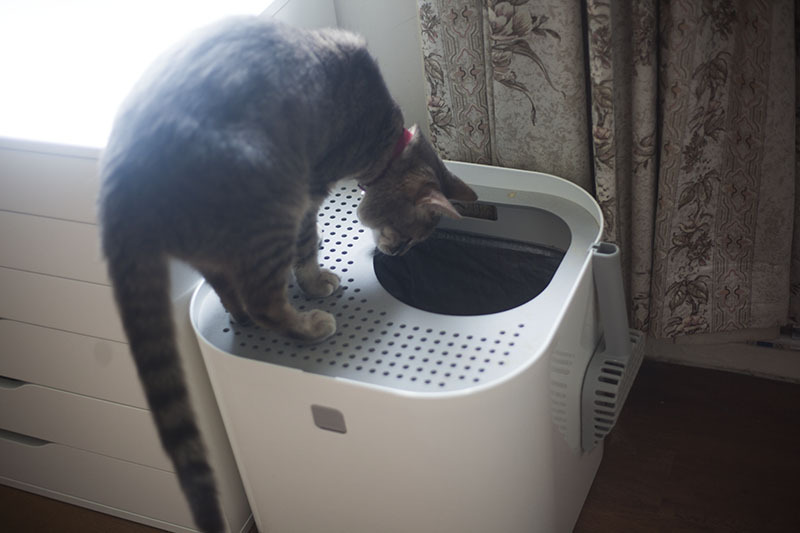 All in all, I’m so happy I bought the Modkat Litter Box. It didn’t disappoint, and I expected it to on at least a couple fronts. 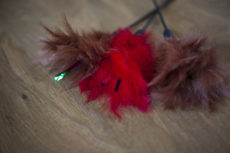 It’s sturdy, reduces tracking, easy to clean, and my cat took to it almost immediately. I’m not the biggest fan of the price tag, but I’m glad to say that at least it’s lived up to my expectations after having bit the bullet and paid full retail for it. 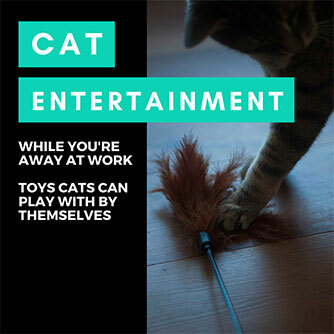 There’s nothing better than a cat product that actually works the way you’re expecting it to. Thanks for the great review! Glad Avery got adjusted to the ModKat quickly. I was curious, how many pounds is Avery, and what kind of litter do you recommend using? My husband and I are adopting our first cat (a beautiful 4-year-old Siberian, she’s around 10 lbs) and we’re hoping that she will be able to adjust to the top-entry litter box (her previous owner says she should be fine with most anything). I’m also going crazy reading through reviews of various litter (Arm & Hammer, PreciousCat, Yesterday’s News, etc.) and was wondering what you use or would recommend based on your experience? I don’t know exactly how much Avery weighs. I’m bad at eyeballing – my husband says roughly 14 pounds. He’s a particularly tall cat, so there’s that for you, and he’s very comfortable using this box. Once I did overfill the ModKat (and I mean WAY overfill). He started off using it normally, then proceeded the next time to sit on the top part, do his business into the hole (as if it was a toilet!) and then go down and cover things up. After that, I scraped excess litter to the sides so that he had enough clearance in the middle to go down comfortably. But yeah, that was way overfilling – like three times as much as I usually put – as I wanted to finish the bag of litter I had. Will not be doing that again! Though if I do accidentally, pushing excess onto the sides to give him a dip for clearance definitely worked. I think it looks smaller in pictures than it really is. Try measuring it out or potentially finding a cardboard box roughly the same size to get a good visual – I don’t really think there’s any cat that would’t fit in here. That being said, let me know if you do get it how good your cat’s been with it. I don’t think you should have any issues. What I use for litter is World’s Best Multi-Cat formula right now. I actually have a review that I’ve written up and forgotten to publish, will get that out ASAP so you can see it. 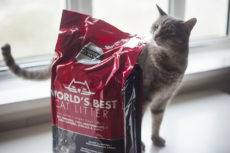 I used to use Blue Buffalo’s Walnut Multi-Cat Litter; was amazing but I can’t get it here in the UK (moved from Canada last year) which accounts for the switch. They’re equally good though honestly I find the World’s Best lasts a lot longer, and while it’s pricey in terms of sticker shock, it lasts so long and does such a good job with reducing smells that I don’t care. Bigger bags are usually cheaper anyway, so that’s what I go for. Again, will get that review out for you, hopefully tomorrow. Any other questions, ask away!